At A52 Executive Cars one of the most requested chauffeur enquiries we get is from couples who are about to get married and are looking for affordable wedding cars in Derby. 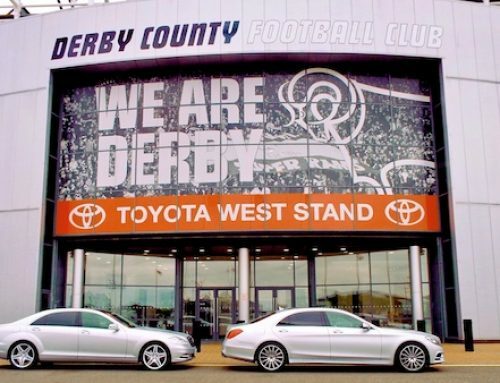 In todays blog post i am going to take a look at our Derby Wedding Cars and try and explain what the difference is between booking an executive taxi and a Derby wedding car package for your special day. Every day i get wedding car enquiries that ask for an executive taxi to take them from A to B but our Derby Wedding car package is so much more than just an executive taxi and thats why the cost is often a little more. It’s wise when looking at wedding cars to not think of the distance you are travelling but more the service you are receiving. We ensure that we never book other jobs around your wedding. The bride should be the focus of the day and everything should be perfect for her. 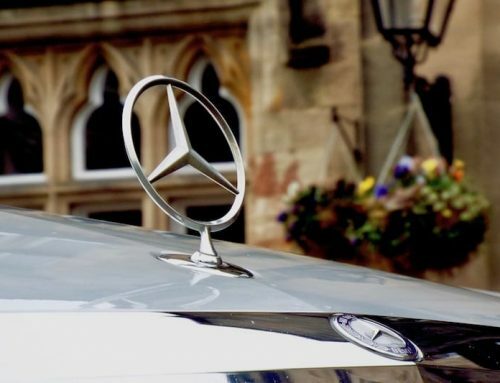 The only way we can ensure that your Wedding Mercedes arrives in tip top condition is to take it off the road for preparation in the run up to your wedding booking. That means your chauffeur wont be rushing to you after just picking up at Gatwick airport in a dirty car and wont have to rush off after your wedding if you need extra time for photographs. 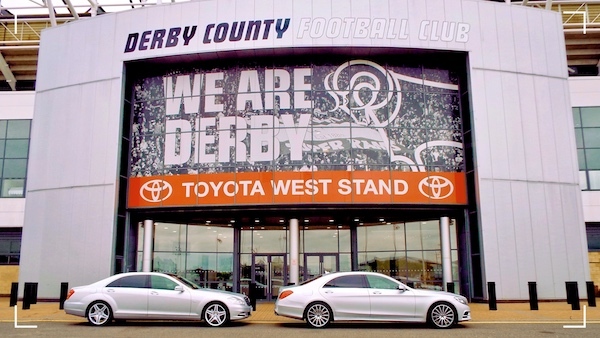 All of our Derby Wedding Cars are fully valeted inside and out and have their bodywork polished before they reach you. We provide complimentary Wedding Car ribbons, bows and floral displays in the car and all cars have modern air conditioning and carry bottled mineral water ensuring that your arrival at the church or wedding venue is calm, cool and collected. Our Chauffeur will always help your day run smoothly. They will be on time, arriving in immaculately clean cars and bringing cleaning materials with them to keep them so. your Derby Wedding car Chauffeur will always be smartly dressed in a grey suit, shirt and matching tie and if you want that little bit of traditional chauffeur elegance we can wear a peaked chauffeur cap and white gloves. We all carry large umbrellas in the car just in case the unthinkable happens and will make sure we are fully aware of travelling times, including up to date road works information. Perfect planning of the routes you need to travel on ensures that if we have to take a diversion due to roadworks or an accident on the road we will still get you to the church on time. A lot of couples like to have Wedding photographs taken in a place other than the church or reception, with our Derby Wedding Car package we can chauffeur you in comfort to a pre arranged spot in the Derbyshire countryside or one of the many country parks for special photographs. We will check out parking beforehand and also do a dry run before your big day to ensure that the route is drive-able and suitable. 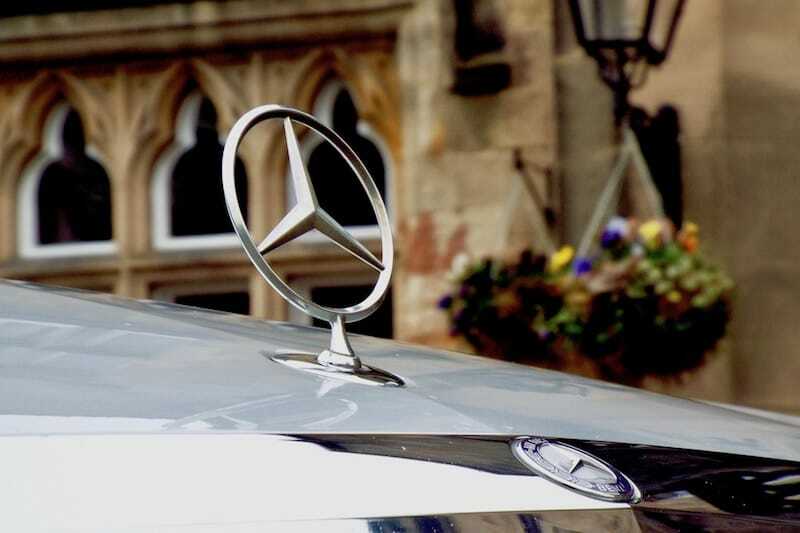 All of our Modern Mercedes Benz Wedding Cars are fully licensed and insured. This means that unlike traditional vintage wedding cars we can also drive your guests if needed or provide you with an elegant going away car and chauffeur in the evening to take you from wedding venue to hotel. We can also provide the all important honeymoon airport transfer if wanted and whisk you off to the airport on your post wedding celebration in style and comfort. In simple terms, when you book a Derby wedding car package with us we allocate the car you book, be it an elegant Mercedes S Class or an affordable Mercedes E Class to be your personal transport on the day of your wedding. We wont take risks by squeezing in jobs beforehand or afterwards and we wont sub contract the job to another company who wont take the same care of you. of course if all you want is a nice car with none of the trimmings to take you to your wedding then we will do that for you but i’m sure you can see from the above that with a Derby Wedding car package you will be getting so much more than just a posh taxi.